Last weekend I looked at my calendar and FREAKED OUT, because I had gone overboard applying for festivals and committing to events. I had accidentally committed to six comics events over the next seven weeks. When I complained on Facebook, Box Brown pointed out that what I actually had done was booked a tour! So here’s the Tiny Report / Paper Rocket Accidental Spring Tour 2015. Hope to see you there! Please bring me words of encouragement and snacks. It’s going to be an intense month and a half. 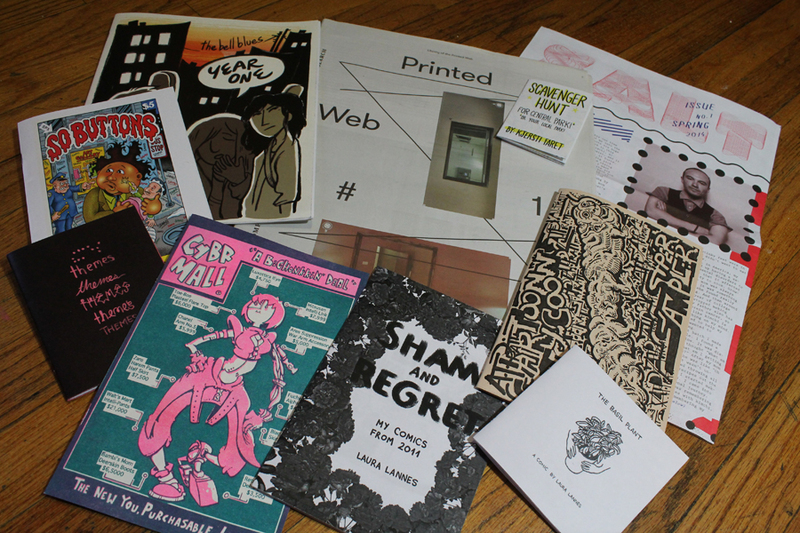 Brooklyn Zine Fest’s exhibitor applications opened today, and will close five days later on January 14. Off hand, I can’t think another festival with such a short application window. It must ease the burden of processing applications when the interest is high and the tables are few. I had a successful show last year (check out my recap), so I’ll be applying again. Rob Clough of High-Low has offered this profile of Cody Pickrodt’s Ray Ray Books. In case you didn’t know, Rob has a wealth of knowledge and enthusiasm for minicomics. 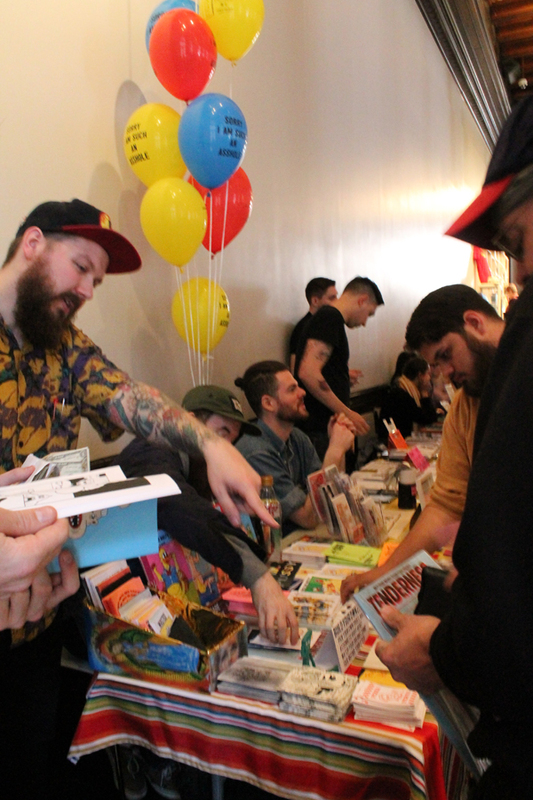 This is unrelated, but while I was searching for an image for this post (and I found the one above) I came across Cody’s excellent scene report of the Brooklyn Zine Fest. I’ll wager it’s the most complete photo record of this show. It’s worth checking out. 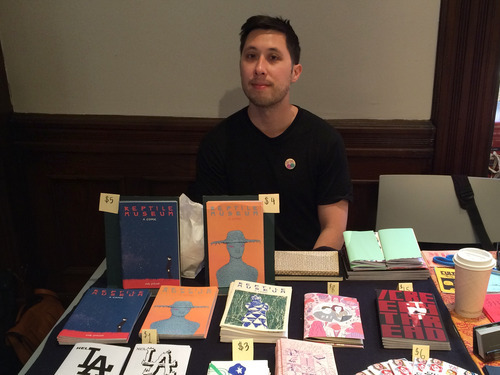 I spent Saturday tabling at the Brooklyn Zine Fest. I have very little but praise for the show and it’s organizers, Matt Carman and Kseniya Yarosh. But there were several changes this year, and each had its pros and cons. My friend Preston, helping me at the table. 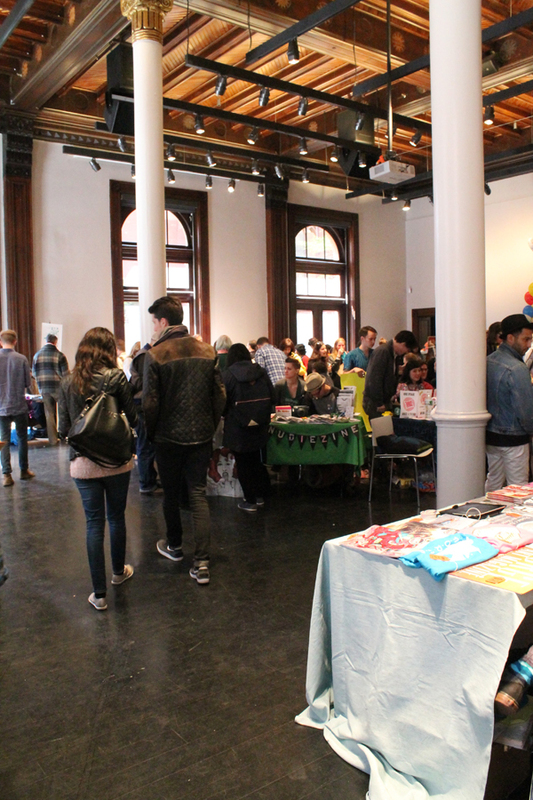 This year the Brooklyn Zine Fest was a two-day event, with a completely different line-up of exhibitors each day. I’d never seen a festival split their exhibitor list this way, perhaps they innovated this idea? (Feel free to correct me on this.) Since the fest was previously a 1-day event, no one could complain about having a single day to exhibit. Still, there are some pros and cons to this approach. Twice as many exhibitors could participate in this show at this location. There was an incentive for attendees to attend both days. Attendees (and exhibitors too) feel like they’re missing out if they don’t attend both days, which might be a bit much to ask of them. Inevitably, there will one day which will be better than the other in terms of attendance, weather, and sales (perhaps in terms of exhibitors too, though there was plenty of good talent on either day). My takeaway is that this was a effective answer to the problem of too many exhibitors, not enough tables. I have no complaints about it. The other major difference this years was the fest’s new venue, Brooklyn Historical Society in Brooklyn Heights. This is a classy venue! You can’t help but feel it dignifies the subject matter. There is an excellent market a block away (Garden of Eden Gourmet). It has a fancy bakery and a salad bar. This saved me! The exhibition area was not a large central space, but spread throughout the building (I have more thoughts on this, see below). This is an opinion, but one I can defend: the former neighborhood of the show, Williamsburg, is more punk rock and zine-friendly than Brooklyn Heights. I’d bet a large number of the exhibitors and attendees live in or around northern Brooklyn, and getting downtown from the L or M line is a real hassle. Working around the installations at Brooklyn Historical Society was slightly challenging at times, but very doable in general. Like at Public Assembly, exhibitors were spread through a small number of separate rooms, rather one central room (as at MoCCA, SPX, etc). But at the Historical Society, these room are very separate: two of them were downstairs. The student room was downstairs and around the corner, and exhibitors in there had it the worst: I ran into several attendees who had no idea this room existed. There were lots of small photocopied signs pointing towards these rooms, but you really need something larger and bolder to standout in the crowd. I’d suggest for future shows that some sort of colorful foot path be attached to floor (if that’s possible). I’m always of the opinion that one large central area is preferable to separate rooms. If you have more than one room, then one of those rooms is going to the best room, and one is going to be the worst. And in this case, the difference was pretty noticeable. The upper level was airy, light-filled, and accessible to the street by two entrances. The downstairs rooms were uncomfortably hot and windowless. This is my biggest complaint about the show: the downstairs rooms were just too hot, and too many attendees didn’t realize they existed. But honestly, these are minor complaints. I understand that putting on a good festival is difficult, and putting on a prefect one is impossible. I enjoyed this show a lot. The venue was gorgeous and the table fee was fantastically cheap. It was just $30 for a half table, which was the only size available (this maximized the number of total exhibitors). Students paid just $15 (kudos to the organizers for offering that discount). The show was well-promoted and it paid off: attendance was great, and people were spending money! 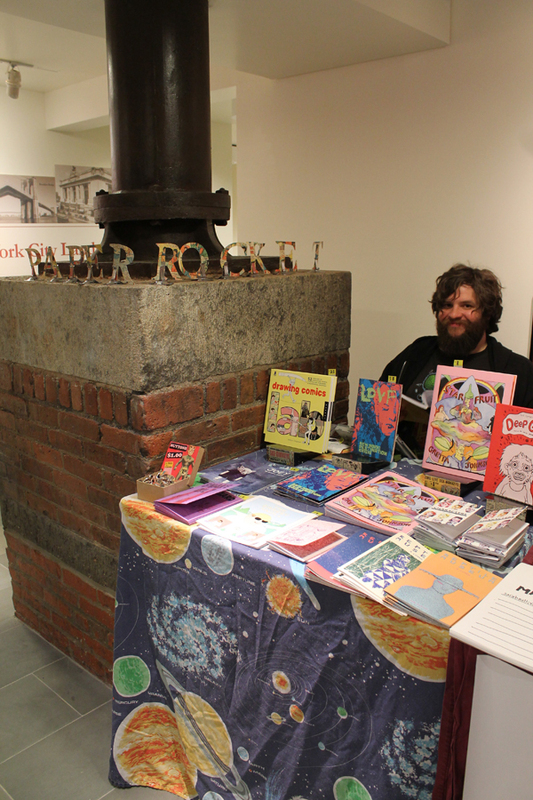 Financially, Paper Rocket hasn’t had a more successful show since Comic Arts Brooklyn. I’d like see more festivals like this one. Since you made it all the way to the end, here are some more photos! The Wizard Skull table was a popular one. 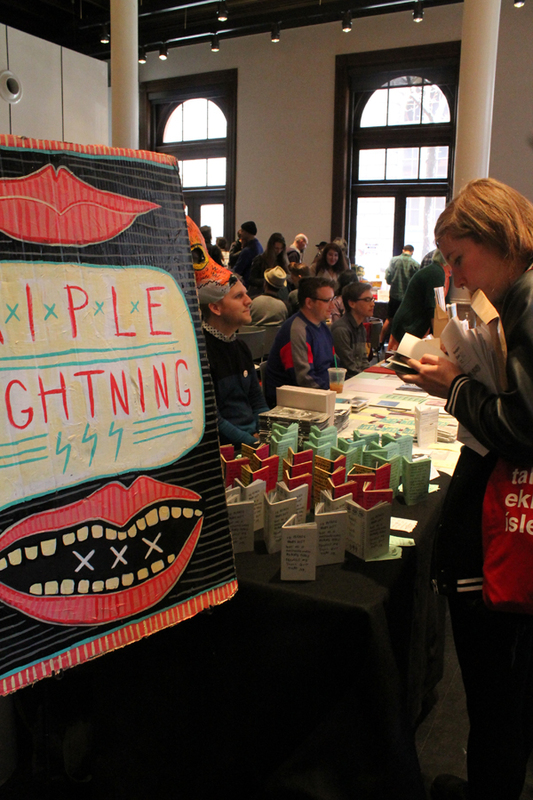 The Triple Lightning table, and more of the upstairs vendors.